Again I'm not going to make river disappear just when I don't need it as border. pamoa wrote: Again I'm not going to make river disappear just when I don't need it as border. Can we see some examples. Pamoa I think you have talent but sometimes you're way too stubborn mate. I guess that's why it's always the same two or three people commenting in this thread. And how do you plan on making all rivers impassables if some of them pass through a single territory and do not act as a border? Do you really want to discuss my map in your thread? I haven't done any updates on it for ages so I don't know what you're referring to. If you have some constructive comments to make you can post in the Cyprus thread. I don't want to hijack your thread even if you're inviting me. Also I cannot go away from this thread. Unless you have not noticed I am the graphics stamp licker for this map. I have been trying to give you constructive comments since page 1. Check the whole thread and you'll see that I'm the person that has left the most comments in your thread. However you seem to think that I am antagonising you. That you are stubborn is a fact, but I also said you have talent so I wouldn't consider that post an insult. Anyway I'll wait for your next update and see how you'll tackle this river issue before making any other comments for the time being. Good luck. Pamoa - is Paris going to start Neutral? Yes , with 4 armies, as it is a +1 bonus on it's own. Last edited by pamoa on Fri Sep 12, 2008 3:54 am, edited 1 time in total. 1 small query - the channel islands appear to be part of France in this map?! You are right they are not french, neither part of the United Kingdom but British Crown dependencies since 1066 when William became King of England. 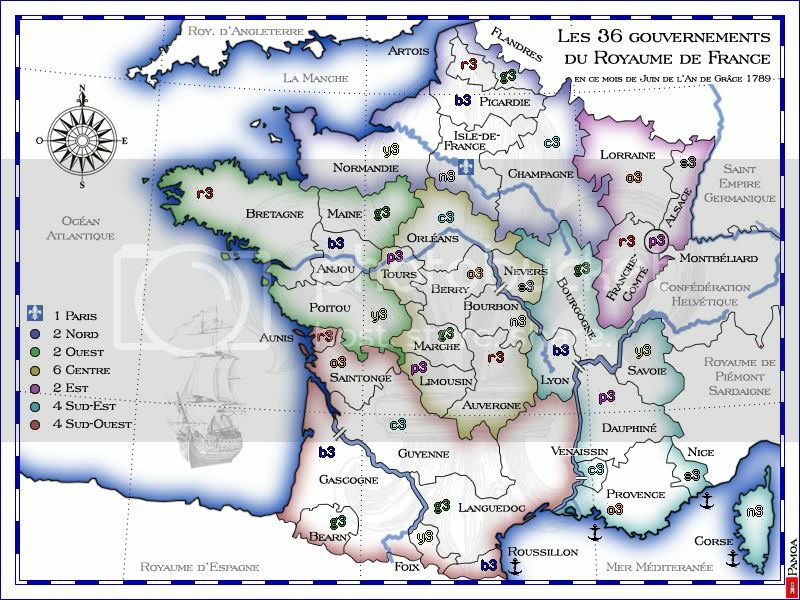 It is the last bit of the Duchy of Normandy since the 10th century and Queen Elizabeth II is often referred to by her traditional and conventional title of Duke of Normandy. So they will go white on the map. Last edited by pamoa on Fri Sep 12, 2008 3:53 am, edited 1 time in total. pamoa wrote: You are right they are not french, neither part of the United Kingdom but British Crown dependencies since 1066 when William became King of England. It is the last bit of the Duchy of Normandy since the 10th century and Queen Elizabeth II is often referred to by her traditional and conventional title of Duke of Normandy. The subtle continent names are a good attempt, but due to the myriad of terrain features are really difficult to read and end up muddling the map (though that's not intended). Instead of big wide semi-transparent names, what about smaller but more distinctive continent names? I really do not like having a blue river convert to a gray river, then back again to blue. could you simply make the entire river blue, but make it really thin, but still use bridges? Possibly have it thicken slightly where you have a bridge. The Neon Peon wrote: I really do not like having a blue river convert to a gray river, then back again to blue. could you simply make the entire river blue, but make it really thin, but still use bridges? Possibly have it thicken slightly where you have a bridge. I have to say I'm going to disagree with this - there has been a lot of discussion on this - and what we have now is the best of it... and I think the effect is really good. I like the rivers as they currently are - bridges in the middle of a territory get too confusing - the solution here is an excellent one. Is it just me, or does the map seem to be too wide? I'm sure you could cut off 50-100 pixels from the left-hand-side of the map without impacting on the playable area at all?? You'd probably need to move the compass/minimap/ship, but I don't think that's a big issue?? TaCktiX wrote: The subtle continent names are a good attempt, but due to the myriad of terrain features are really difficult to read and end up muddling the map (though that's not intended). Instead of big wide semi-transparent names, what about smaller but more distinctive continent names? yeti_c wrote: I have to say I'm going to disagree with this - there has been a lot of discussion on this - and what we have now is the best of it... and I think the effect is really good. MrBenn wrote: I like the rivers as they currently are - bridges in the middle of a territory get too confusing - the solution here is an excellent one. This river stuff could last for ages and I know I will read comments about it even when it will be online, if it never goes. But as it seems that at least some people are satisfied with it and as I think it is perfectly understandable for an average intelligent person, it will remain as it is. MrBenn wrote: Is it just me, or does the map seem to be too wide? I'm sure you could cut off 50-100 pixels from the left-hand-side of the map without impacting on the playable area at all?? You'd probably need to move the compass/minimap/ship, but I don't think that's a big issue?? The map is 600x800 which is less than the 800x840 authorised. I don't see any benefits in having a narrower, crowded map. Benn I am going to have to respectfully disagree with you on this one. I think the map is nicly presented without any space being left unutilised. He probably could reduce the size but I don't think their is a real need for it. pamoa - I don't think I've really commented on this map yet, but it's outstanding. You have nice control over photoshop . I don't have time right now to read back through the posts, but I'll comment on what I see right now. * color choices are great. Your mountain range is great. It fits into the map perfectly. * Your fonts are nice also. The whole map style you've nailed down. * I think when I look at this map, I don't like the glow in the water. Maybe there's just too much white in general. If I remember correctly, the glow was a big discussion point a while ago. So much so, that you took a break from development. I don't want that to happen - but I personally would prefer less glow, less white, and more solid color. * your map is not too wide. I guess that's it really. It's one of the best maps in development right now. Well Done! RjBeals wrote: I think when I look at this map, I don't like the glow in the water. Maybe there's just too much white in general. If I remember correctly, the glow was a big discussion point a while ago. So much so, that you took a break from development. I don't want that to happen - but I personally would prefer less glow, less white, and more solid color. Thanks for commenting. This map started as white based Ireland-like map. At the start see was even less strong. So what you see is, I think, a good compromise. This map is already miles better than the existing France map, what's holding it up? As someone already mentioned the regions' names are barely legible. Maybe adding a dark outline (stroke) to the text could help...but it could also be a bad idea as it might create even more confusion. Either way I suggest you try to do something about the regions' names legibility.